Fig. 3.1 High Energy Venturi Scrubber Systems are designed to remove fine micron and submicron particulate from industrial and commercial effluent gases. High Energy Venturi Scrubber System is a wet scrubbing system that combines a High Energy Venturi Scrubber with a Cyclonic Separator. These scrubbers are effective in the removal of dusts, fumes, vapors, and mists; as well as a variety of other air pollutants. Removal efficiency is related to the characteristics of the contaminant and the pressure drop induced across the throat section of the venturi. 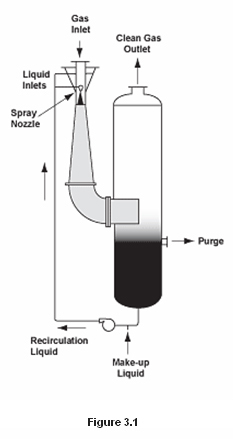 The Cyclonic Separator operates on the inertial effect which makes the heavier liquid and solid materials travel in a path around the walls of the separator and the gas or vapor takes a path toward the center. By suitably locating the exits, the separated streams are collected for further processing. Efficiencies of up to 99% can be realized in many applications. The Fig. 3.1 High Energy Venturi Scrubber System special gas inlet design significantly reduces solids build-up at the inlet. The High Energy Venturi Scrubber System is versatile enough to meet practically every submicron requirement. When conditions require it, additional equipment, such as a pre-cooler, can be installed. The Cyclonic Separator efficiently separates solids or liquids from gas streams. The dry collection of materials, or at least the separation without further liquid contacting, may thus prevent processing or corrosion difficulties in the process or in the collecting material. Lime dust removal from storage vents. Air Poll Engineering is the leading pollution control and process Improvement Company. We create value for our industrial and institutional customers by developing and implementing innovative, differentiated solutions that are financially, technically and environmentally sustainable.